STOCKBRIDGE, MA.- Norman Rockwell Museum announces the honoring of Barbara Nessim as its first Artist Laureate. Nessim, an internationally known artist, illustrator, and educator, also served on the Museum's Board of Trustees from 1999 until 2008. The award will be presented to Nessim on behalf of the Museum's new Rockwell Center for American Visual Studies during its annual Board of Trustees meeting, held on Saturday, September, 26. "We are honored to award our inaugural Artist Laureate award to Barbara Nessim," says Laurie Norton Moffatt, Director/CEO of Norman Rockwell Museum. "The commendation of this award recognizes Barbara's exceptional skills as an influential visual communicator and an early visionary in the digital arts. 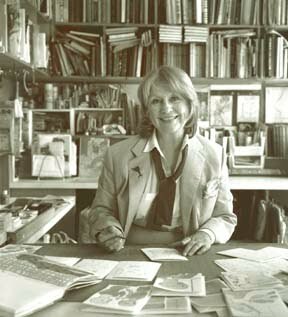 Barbara's ongoing dedication to the Museum, where she has worked closely with curatorial staff, and served as a passionate advocate for the Museum's expanded collection mission continues as she lends her vision and support- connecting the Museum to new illustration communities and younger artists." A selection of Barbara Nessim's work will also be on view at Norman Rockwell Museum starting Saturday, September 26, and includes "Women In Madness," an original work generously donated by the artist for inclusion in the Museum's illustration art collection. Later that day, Nessim will present "Graphic Change," an illustrated talk about her evolution as an artist and her creative inspirations. Illustrator Barbara Nessim has been a vital contributor and influential visionary in the art world over the past several decades. A digital art pioneer, Nessim helped shape the MFA Computer Arts Program at the School of Visual Arts, and was Chairperson of Illustration at Parsons School of Design for 12 years. Her work has graced the covers of Time, The New York Times Magazine, Rolling Stone, and many other publications. Most recently, the artist has been commissioned to create several large-scale works for various building lobbies in New York City. In addition to several years of dedicated service as a member of Norman Rockwell Museum's Board of Trustees, Nessim acted as liaison to the Museum's Illustrators Advisory Committee, helped develop the exhibition and participated in early discussions related to the development of the Rockwell Center for American Visual Studies. In addition to Norman Rockwell Musuem, an exhibition of Nessim's art will also be on view at The Sienna Gallery in Lenox, Massachusetts, starting September 25. Many congratulations to you on getting honored by the Norman Rockwell Museum. Thanks! Hello Foster, I'm just seeing your comment now months later - Thank you for your kind words. I'm so honored to be the Norman Rockwell Museum's first Artist Laureate. To apply for the payday advances, we would state it is less demanding to do than to state. You can apply for payday advances web based utilizing Internet. There are numerous payday advance organizations out there that will attempt to motivate you to expand or "move over" your payday advance.